These cupcakes can be made with the Toblerone on top or get creative and chop them roughly and add them straight into the mix. These cupcakes are nice and light and full of air. Preheat your oven to 170C. If you have a fan oven like I do, reduce the temperature to 160C or you might over bake the cupcakes. Line a 12-home muffin tin with paper cups. Blend together the sugar and butter. I do this with an electric hand blender. I use unsalted but salted butter will add depth to the recipe. Beat until light in colour meaning it is well blended. The butter should be completely mixed with the sugar. Add the eggs and blend together. Fold in sifted flour and cocoa powder. It is important to use a good quality cocoa powder here and not a drinking chocolate. Drinking chocolate has added sugar and other things. A quality cocoa powder is unadulterated and best for baking. 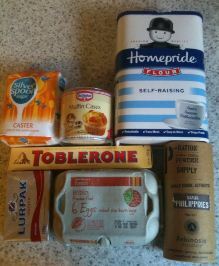 I use Askinosie but you can use any quality cocoa powder from Waitrose, Sainsbury’s or other local supermarkets. Once the flour and cocoa powder has been mixed in, if you want to add the Toblerone as roughly chopped chunks you can, or wait and place a single triangle in each one as I did. Place a dessertspoon full (or ice cream scoop) in each paper. If you have batter left over, evenly distribute it between cups so each has the same amount of batter. 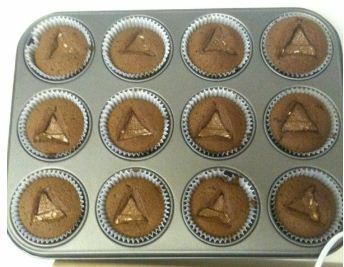 Once filled, Place a single triangle on top of each cupcake and gently press in. There were exactly 12 triangles in a 100g bar. Place in preheated oven for 15 – 20 minutes, until they are springy to the touch or use a kitchen witch as I do – take a piece of straw from the kitchen witch and poke into cupcake. If it comes out clean, your cupcakes are baked through. Allow to cool before serving as the chocolate and especially nougat in the chocolate will be hot and can burn sensitive mouths.